The fear of job-stealing robots has been recently stoked in the media and pundits frequently refer to automation as a key driver of long-term middle-class wage stagnation. But are robots actually transforming the labor market at an unprecedented pace? Nope—in fact, the opposite is true. First, it’s important to note that technology and automation have consistently transformed the way work gets done. So, technology itself is not a problem. Robots and automation allow us to increase efficiency by making more things for less money. When goods and services are cheaper, consumers can afford to buy more robot-made stuff, or have money left over to spend on other things. When consumers spend their leftover cash on additional goods and services, it creates jobs. These new jobs help compensate for the jobs lost to automation. But are robots now eroding jobs and replacing human labor at a faster pace that the economy can’t absorb? Again, no. Perhaps surprisingly to some, the data on investments and productivity do not reveal worrisome footprints of accelerated robot activity: in fact, in recent years the growth of labor productivity, capital investment and, particularly, investment in information equipment and software has strongly decelerated in the 2000s. There is no basis for believing that robots or automation are having an unusual transformative effect on the labor market. 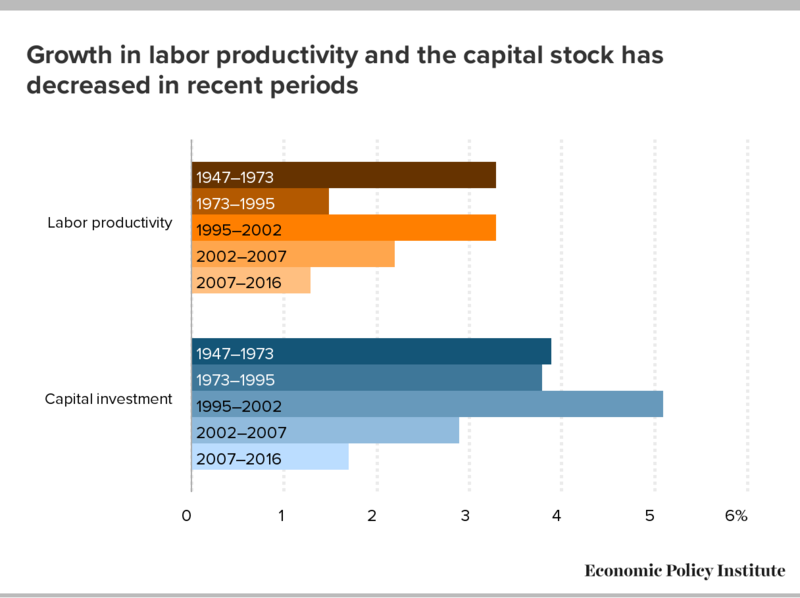 The first chart below shows that productivity and capital investment did indeed accelerate during the late 1990s tech boom. But productivity and capital investments were much slower in the recovery from 2002–2007, and decelerated further in the period since the Great Recession. 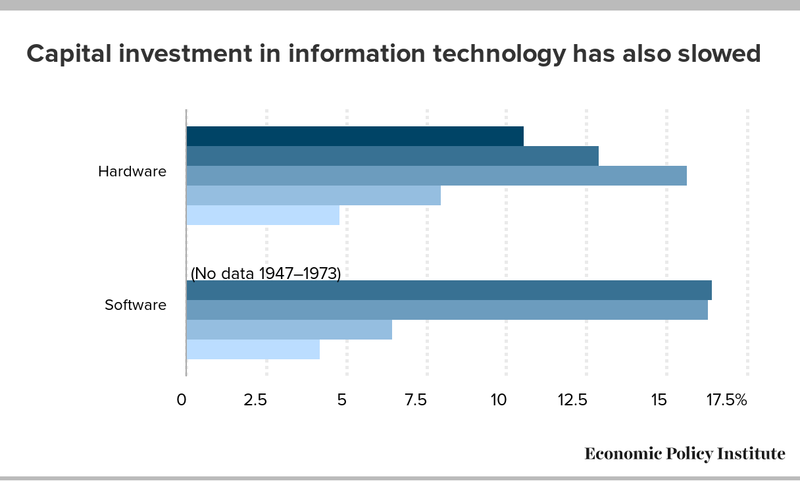 The second chart looks more closely at two components of capital investment, information processing equipment investment (mainly computers and communications equipment), and software investment. Information processing equipment investment grew at a 8.0 percent annual rate over the 2002–2007 period, roughly half the 15.6 percent rate of the 1995–2002 period, and grew even more slowly (4.8 percent annually) after 2007. If technology were rapidly transforming our workplaces, we would expect to see exactly the opposite—a surge in the use of information equipment and software in the production of goods and services. That is what occurred in the late 1990s, but it is not happening now. Note: Using latest available data, 2016 measure includes data from 2015Q4–2016Q3. We need to give the robot scare a rest. Robots are not leading to mass joblessness and are not the cause of wage stagnation or growing wage inequality. Recently, the New York Times referred to the robot scare as a “distraction from real problems and real solutions.” Instead, we should focus on policy choices that lead to things that truly threaten workers and their families like eroding labor standards, declining unionization, elevated unemployment, unbalanced globalization, and declining top tax rates.